Passion flower or passionflower belongs to a family of fast growing vines commonly found across the Americas and occasionally in Southeast Asia or Australia. Passiflora incarnata has a long history of use in different areas of the world for its therapeutic abilities. In Europe, it has long been valued as a treatment for restlessness, anxiety and insomnia. In North America it has traditionally been brewed as a tea for its sedative and sleep promoting effects. The Brazilians have traditionally put it to good use as a wormicide, an anti-spasmodic and to treat asthma and allergies. Various cultures have also used it to treat hysteria, epilepsy, neuralgia and opiate dependence. When preparing the herbal remedy, the plant’s leaves, stems and flowers are all used and it is available in several forms including teas, infusions and tinctures. While it is best known these days for its ability to calm the mind, passion flower contains mild analgesic properties and can be used for pain relief. Passion flower contains active phytochemicals including a group of alkaloids responsible for its anti-anxiety and antidepressant effects. Indeed studies have proven that passion flower is not only a safe alternative to conventional anxiety medication but it is potentially just as effective as a drug like oxazepam. Recent years have seen a growth in scientific research into the efficacy of passion flower especially in regard to its sedative and anti-anxiety potential and while some of these studies have been relatively small scale, many of the results have been promising. Passion flower is a common ingredient in sedative teas in combination with other herbs known for their sedative effects such as chamomile, valerian, lemon balm and kava. It can also be used alone though its effects may not be quite as potent. The calming ability of passion flower is thought to be down to a process which increases the releases of a specific brain neurotransmitter which stimulates the release of a chemical called GABA known to reduce anxiety and improve mood. It is worth noting here that GABA also helps relax the muscles, which is why passion flower has been used for epilepsy and other seizures. 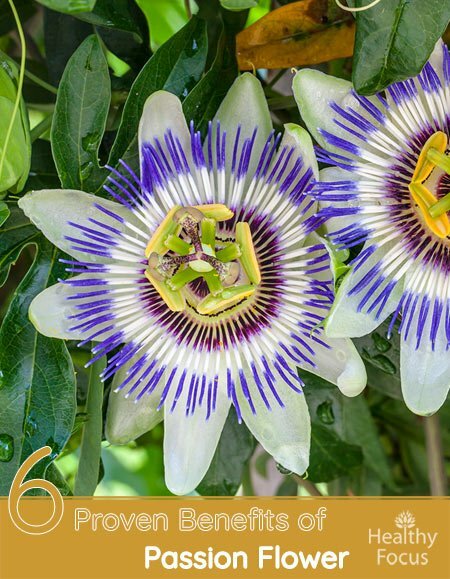 Several studies have been conducted into passion flower’s potential to ease anxiety including a study published in 2008 looking specifically at preoperative stress. 90 minutes prior to surgery, 60 patients were given either 500mg of passion flower extract or a placebo. Another study focusing on patient’s anxiety prior to undergoing dental surgery appears to confirm the previous findings. 63 patients who experienced varying levels of anxiety were separated into 3 groups and given passion flower drops, a placebo or nothing at all. The results indicated that those given passion flower before dental surgery experienced a significant reduction in anxiety compared with the other two groups. (2) While researchers conceded the need for larger scale studies in future, this is potentially great news for people like me who are sent into a blind panic just at the thought of a dental chair. When it comes to its anxiolytic effects, it is very important to differentiate between the two main passion flower species. We are talking here about Passiflora incarnata as opposed to Passiflora edulis. Research has found that while the former has significant anti-anxiety properties, the latter has almost none. 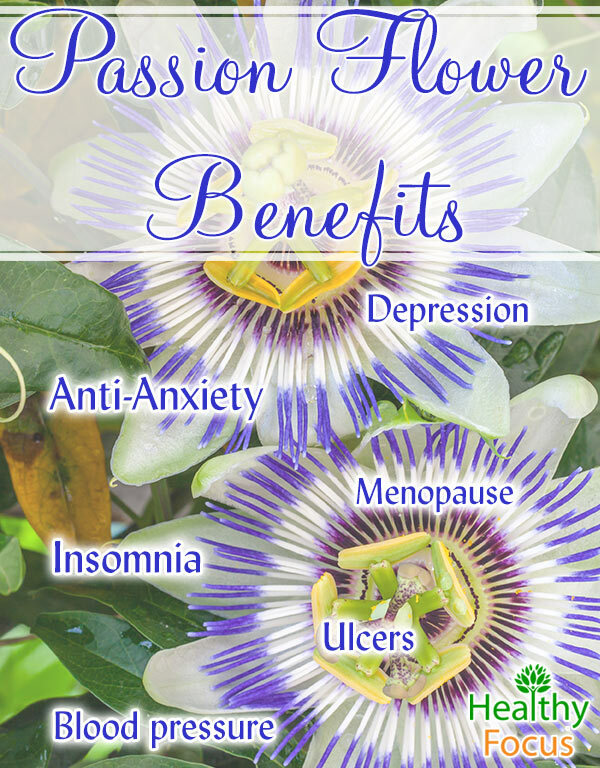 The fact that passion flower can ease anxiety and depression and aid sleep makes it especially useful in easing some of the symptoms common to women undergoing the menopause. Low estrogen levels can cause a variety of complaints. Typically, menopause complaints include depression, anxiety, sleeping difficulties and headaches. 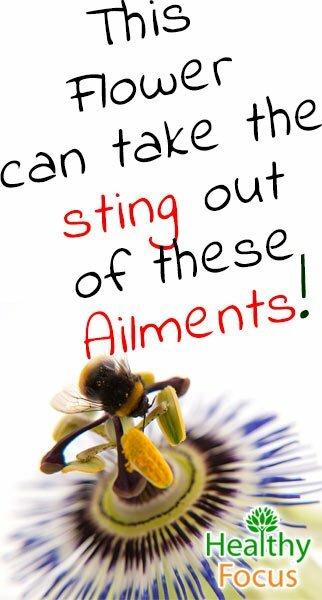 Research has shown that these symptoms might be significantly reduced with passionflower supplementation. Passion flower has long been used to promote sleep and is seen as a useful weapon in the battle with insomnia. A number of animal studies have confirmed its potential but until 2011 it had not been tested on human subjects. According to studies done on animals, passion flower supplements might cause a reduction in blood pressure. A study published in 2013 found that passion flower extract in doses of 50 mgs per kilo of body weight lowered blood pressure significantly in rodents. Researchers believe that the blood pressure reduction was a result of antioxidant compounds present in passion flower called edulilic acid. Up to now there have been no scientific studies conducted on human patients with regard to passion flower and its effect on blood pressure bit other animal studies have confirmed the findings. As with so many herbal remedies, passion flower extract is generally considered safe but not enough is known about its effects to ignore the potential risks especially when taken in very large doses. There is a risk of increased drowsiness because of its sedative effects but more serious side effects are possible albeit rare for healthy adults. Rare reported side effects include dizziness, loss of coordination, vomiting and palpitations. Pregnant women are not advised to take passion flower extract because of the possibility that it will cause contractions in the uterus. If you are breastfeeding, it is best to err on the side of caution and avoid passion flower. Not enough is known at this stage to be certain of its safety on breastfed infants. Passion flower might interact with certain medications and those taking sedative medications or medicine prescribed for high blood pressure should avoid this herbal remedy unless they speak with their doctor first.